The Ling-Temco-Vought A-7 Corsair II is a carrier-capable subsonic light attack aircraft introduced to replace the Douglas A-4 Skyhawk. The A-7 was one of the first combat aircraft to feature a head-up display (HUD), an inertial navigation system (INS), and a turbofan engine. In 1962, the United States Navy began preliminary work on a replacement for the A-4 Skyhawk, one with greater range and payload. Emphasis was placed on accurate delivery of weapons to reduce the cost per target. The requirements were finalized in 1963. To minimize costs, all proposals had to be based on existing designs. Vought, Douglas Aircraft, Grumman, and North American Aviation responded. The Vought proposal was based on the F-8 Crusader fighter, having a similar configuration but shorter and stubbier, with a rounded nose. It was selected as the winning proposal, and in March of 1964 the company received a contract for the initial batch of aircraft, designated A-7. 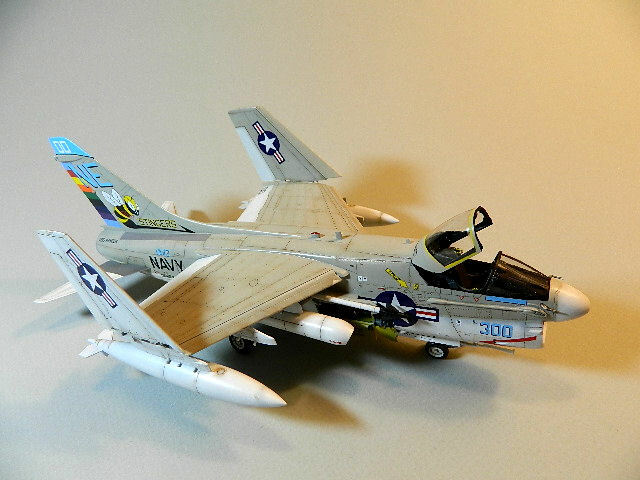 In 1965, the aircraft received the popular name Corsair II, after the F4U Corsair of World War II. 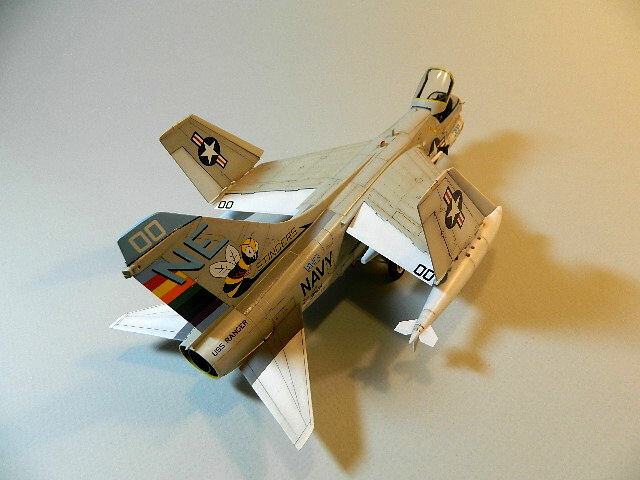 Compared to the F-8 fighter, the A-7 had a shorter, broader fuselage. The wing had a longer span, and the unique variable incidence wing of the F-8 was omitted. To achieve the required range, the A-7 was powered by a Pratt & Whitney TF30-P-6 turbofan producing 11,345 lb of thrust. 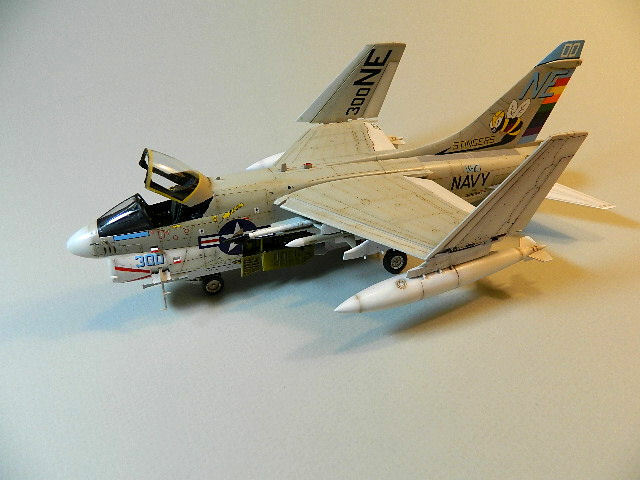 The Corsair II entered service with the United States Navy during the Vietnam War. It was later adopted by the United States Air Force, including the Air National Guard, to replace the Douglas A-1 Skyraider, North American F-100 Super Sabre, and Republic F-105 Thunderchief. The aircraft was also exported to Greece in the 1970s and Portugal in the late 1980s. The A-7 served in Southeast Asia, Grenada, Lebanon, Libya, and Operations Desert Shield and Desert Storm. There are eight sprues of light grey plastic, one clear sprue, a small, three part photo etch fret, and the decal sheet. I did find a bit of flash on a few of the parts, but it was nothing significant. The parts overall are well molded with crisp detail and finely engraved panel lines and rivets. The box art is a striking photo of a CAG A-7E from the USS Ranger, VA-112, a photo worth framing. 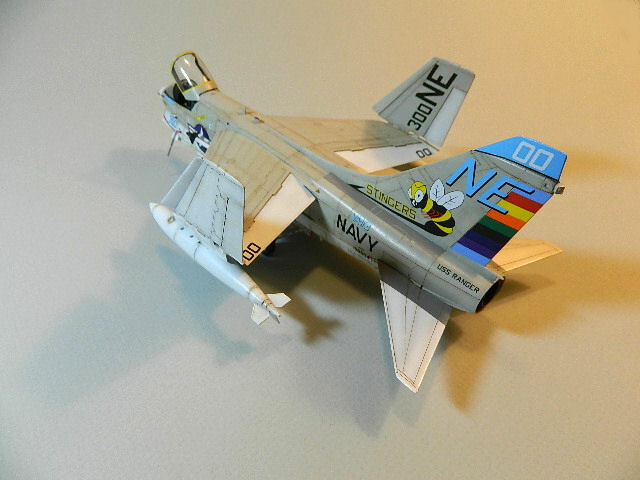 The instructions follow the traditional Hasegawa format of the fold-out variety with exploded views for the various construction steps, and includes a separate flier for the specific markings for this special edition. The cockpit consists of a tub, side console top panels, rear wall, control column, and rudder pedals. The multipart ejection seat finishes the cockpit quite nicely. I planned to add PE seatbelts, but they were not available in time to finish this project. The instrument panel has raised details for the dials and switches and is fitted to the forward cowling which, in turn, fits in place on the front ledges of the cockpit. The separate windscreen attaches to the front cowling. The rear canopy section may be added in an open or closed position. The first task was to fit the intake halves together after the prominent ejector pin marks were properly addressed. The intake trunck is comprised of top and bottom sections, which results in longitudinal seams along both sides. Some filler and sanding plus an application of latex house paint pretty well eliminated the joints and resulted in a pure, flat white interior. The horizontal stabilizers may be posed. Several service panels in the lower nose section may be posed either open or closed. If mounted open, the fine detail on the inside will require careful painting to enhance the effect. The large ventral speed brake may be posed open or closed. A few reference photos do show the speed brake partially open when the aircraft is parked. If it is to be in an open position, some minor surgery on the brake is required. Nose weight was not required, but to be on the safe side I did add a few split shot to the nose section to eliminate any possible tail-sitting. 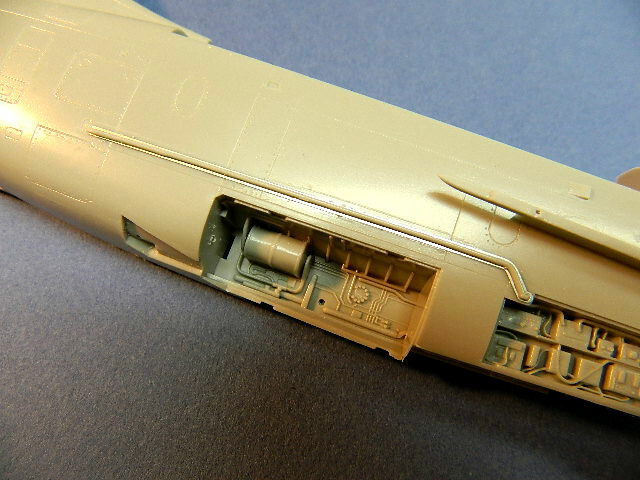 The exterior piping on both sides of the fuselage are mounted on matching PE (for lack of a better term) flanges. The PE and plastic parts must be carefully aligned before the adhesive is applied. I used Future floor wax applied with a fine paint brush. When the Future had dried sufficiently, I used a piece of cotton cloth dampened with Windex to remove any residue. The wings include optional-position leading and trailing edge flaps, plus raised or lowered wing tips. Holes must be drilled in the two lower main wing sections for mounting the various pylons. There are no locator pegs for the center wing assembly, and therefore the parts must be carefully aligned before any solvent is applied. The outer wing section does include locator pegs, but care is still required to achieve the correct alignment. 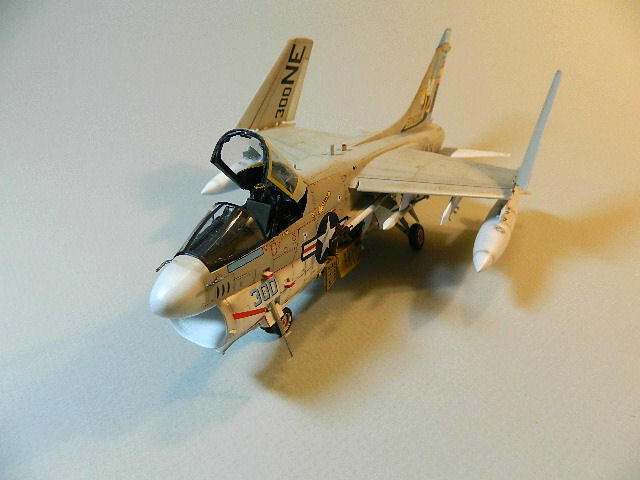 The only weapons included in the kit are the side-mounted AIM-9B/D Sidewinder missiles. Other weapons may be obtained from several Hasegawa weapons sets. The instructions offer information on what weapons are mounted on the various underwing pylons. The kit does include a FLIR pod for mounting on weapons station 6. The separate anti-sway braces must be added to each pylon. The assembled model was first primed with a thin coat of Rustoleum Painter's Choice and allowed to dry for at least 24 hours. Next, all the panel lines were pre-shaded with a thin mix of Tamiya XF-1 Flat Black and XF-64 Flat Red Brown. 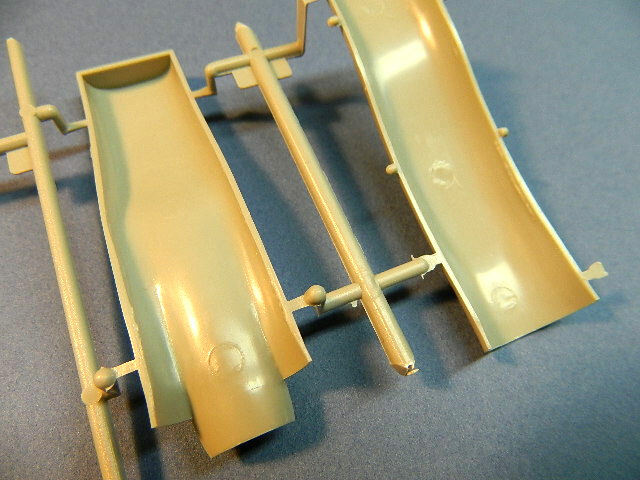 The undersides were painted with a 1:1 mix of Tamiya X-2 and XF-2, and the topside with Model Master Acryl Gull Grey. Several clear gloss coats were applied and allowed to cure. Markings for two aircraft are included on the decals sheet: the 1976 Bicentennial for VA-113 "Stingers" and the 1978 markings for the same aircraft. Both are very colorful and will make the modeler's decision on which markings to use all the more difficult. I chose the 1978 version. The decals were magnificent, to say the least. Within seconds of being wetted, they were ready to place on the model. Once in position, they settled down nicely and conformed to all recesses and raised details. 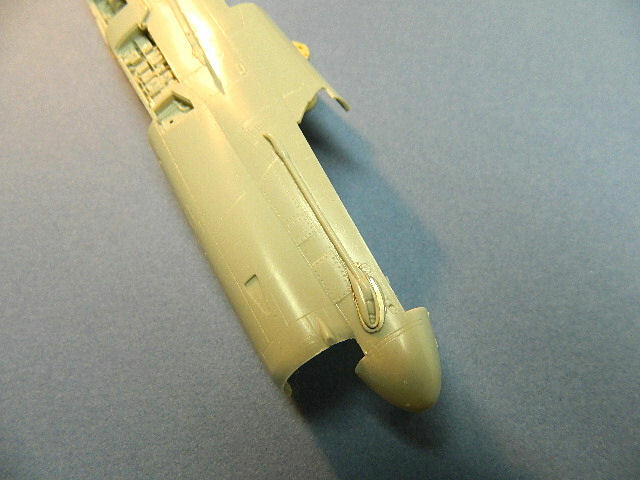 After the decals had dried overnight, a satin finish was applied, the loose parts fitted in place, and the model was done. I wanted to add the Hasegawa A-7 Corsair II to my collection for some time now. 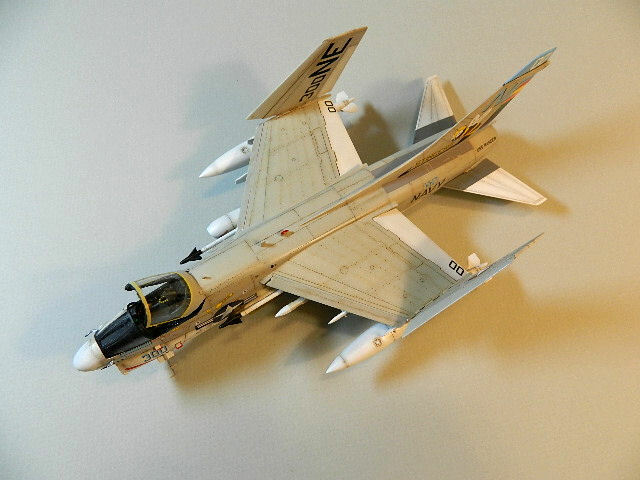 The opportunity to build and review this particular kit was quite rewarding, and I would recommend this kit for any modeler interested in jet aircraft. It is not a complicated kit and was an enjoyable build. I wish to thank Hobbico and IPMS/USA for the opportunity to review this product.